Develop a research project with relevance to the Industrial Internet of Things (IIoT) utilizing POWERLINK. This Industrial Ethernet Award is the fourth installment of the popular university contest hosted by the Ethernet POWERLINK Standardization Group (EPSG). 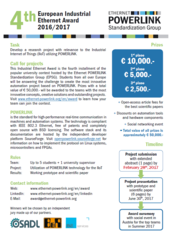 Students from all over Europe will be answering the challenge to create the most innovative automation project based on POWERLINK. 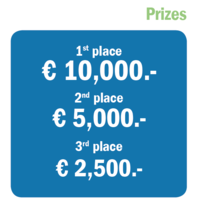 Prizes with a total value of € 50,000.- will be awarded to the teams with the most innovative concepts, creative solutions and outstanding projects. is the standard for high-performance real-time communication in machines and automation systems. The technology is compliant with IEEE 802.3 Ethernet, free of patents and completely open source with BSD licensing. The software stack and its documentation are hosted by the independent developer platform SourceForge. Visit openpowerlink.sourceforge.net for information on how to implement the protocol on Linux systems, microcontrollers and FPGAs. In order to register, please send us an email with the contact information of your team members, your supervisor’s contact, details about your university as well as a description of your study program. 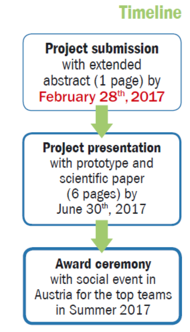 Please do not forget to attach your extended abstract (1 page). An extended abstract commonly consists of a short description, an illustration visualizing the principle of operation as well as the approach to solve the problem. Join our LinkedIn group to stay up to date with the newest information. The 4th Industrial Ethernet Award is a promotional event organized by the EPSG; therefore, the EPSG has the right to use the submitted projects for marketing purposes (website, newsletters, fairs, etc.). The intellectual property stays at their respective holders.